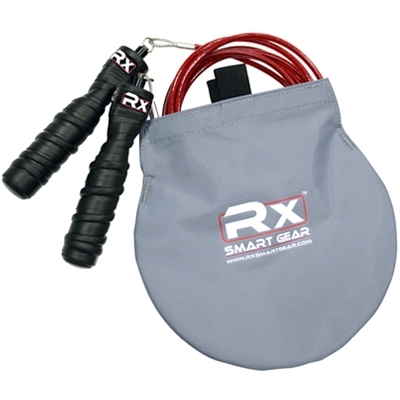 Create just the right amount of resistance with the ideal workout tool that you can use anyw..
Rx Jump Ropes use an industrial grade multidirectional swivel axis bearing system producing a near frictionless rotation. Our patent pending swivel attachment allows for the cable to reach top speeds or slow it down to suit the athlete’s needs. The Rx philosophy is that it’s not about PURE speed but rather the RIGHT speed to suit each individual athlete’s tempo and timing. AIRCRAFT GRADE CABLE WITH PVC COATING. OUR LIGHTEST OFFERING WEIGHING ONLY 1.3 OUNCES FOR A 9 FOOT LENGTH (EXCLUDING HANDLES). MOST COMPARABLE TO TRADITIONAL SPEED CABLES. THE PVC COATING DOES NOT RETAIN MEMORY AND THEREFORE UNCOILS NICELY. 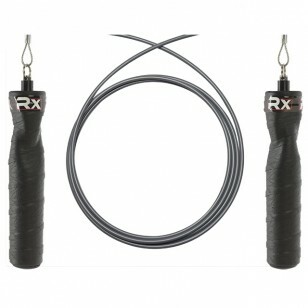 THIS CABLE PRODUCES THE FASTEST CYCLE RATE THEREFOR THE ATHLETE MUST BE EXTREMELY PROFICIENT AT DOUBLE UNDERS. RECOMMENDED FOR ADVANCED JUMPERS WHO CAN ALREADY TURN 75+ DOUBLE UNDERS. AIRCRAFT GRADE CABLE WITH PVC COATING. OUR SECOND LIGHTEST CABLE WEIGHING 1.8 OUNCES FOR A 9 FOOT LENGTH (EXCLUDING HANDLES). THE ULTRA 1.8 IS CONSIDERED OUR “HYBRID SPEED CABLE” DUE TO ITS LIGHT NATURE WHILE OFFERING MORE FEEDBACK TO THE ATHLETE. THE INCREASED RESISTANCE ALLOWS THE ATHLETE TO TURN THE ULTRA 1.8 CABLE AT A SLIGHTLY SLOWER CYCLE RATE THAN THE HYPER 1.3 YET TRIPLE UNDERS ARE STILL PLENTIFUL. RECOMMENDED FOR ADVANCED JUMPERS WHO CAN ALREADY TURN 60+ DOUBLE UNDERS. AIRCRAFT GRADE CABLE WITH PVC COATING. OUR SECOND TO HEAVIEST CABLE WEIGHING 3.4 OUNCES PER 9 FOOT LENGTH (EXCLUDING HANDLES). OUR DUAL THREAT CABLE WHICH PROVIDES TREMENDOUS FEEDBACK ALLOWING THE ATHLETE TO JUMP WITH A BROADER RANGE OF TEMPOS FROM VERY SLOW TO SUPER FAST.  IDEAL FOR BEGINNERS TO GAIN A BETTER FEEL FOR TIMING WHILE JUMPING AT SLOWER TEMPOS. 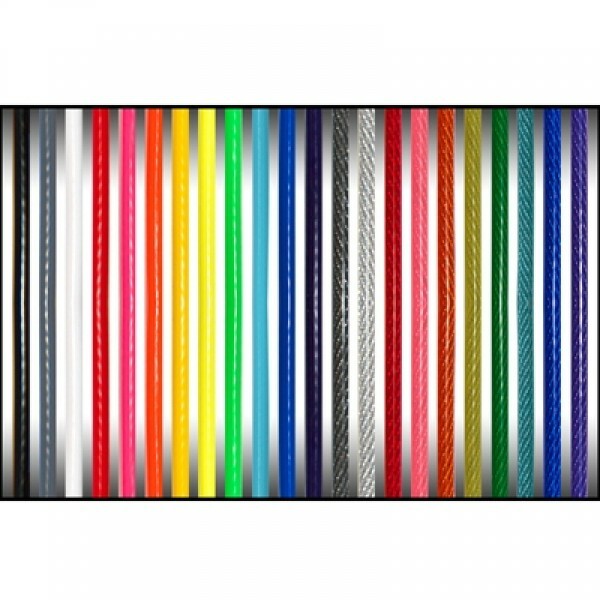 ALSO A FANTASTIC TRAINING CABLE FOR ADVANCED JUMPERS LOOKING FOR GREATER RESISTANCE AND INTENSITY IN THEIR TRAINING. 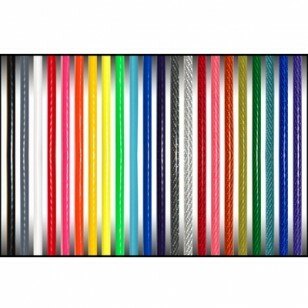 AIRCRAFT GRADE CABLE WITH PVC COATING. CURRENTLY OUR HEAVIEST CABLE WEIGHING 4.1 OUNCES PER 9 FOOT LENGTH (EXCLUDING HANDLES). OUR BRUISER CABLE THAT PROVIDES THE PAIN THAT MASOCHIST SEEK IN THEIR HIGH INTENSITY TRAINING. 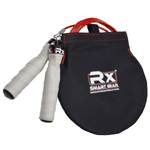 ALSO GREAT FOR BIGGER, STRONGER ATHLETES NEEDING MORE RESISTANCE AND FEEDBACK THAN MOST TYPICAL JUMP ROPES PROVIDE. 5’5” (165cm) 2’10” 8’3” - 8'4"
6’4” (193cm) 3’0” 9’4” - 9'5"
This Gold's Gym Fitness Ball targets your abs and lower back to help tighten your core mu..
Red 1/2" Wide Loop Resistance Band. Body Bands Pro Elite Series 41" Layered Loop Bands are i..
Increase your speed and agility by working with the SKLZ Quick Ladder. Getting your..